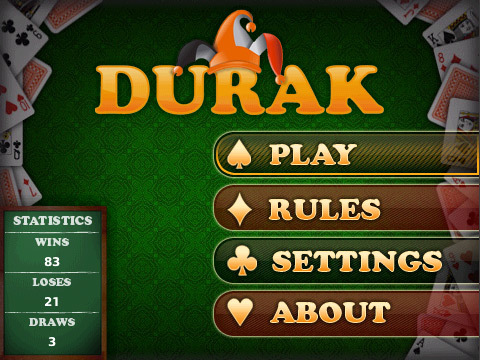 Durak - Fans of card games beware, addictive! Durak is a popular card game, originating in the Soviet states, that pits player vs player in an attack/defense style card-shedding game. The last player to get rid of all his cards, is the "durak" or fool. BerryBlow has brought this game to the BlackBerry platform, and done it well, with great graphics and addictive play. With the ability to play a game with anywhere from 2 to 4 players, and 3 levels of AI difficulty, it will be a long time before you get bored playing. The rules of the game is simple yet challenging and thankfully included in the app for those not familiar with the game. Well put together and a great way to kill some time whenever the need arises, the app is also on sale right now in the CrackBerry App Store for $2.99 until July 31st. After that, it's only $4.99 - still a good price for an app that will keep you occupied for a good while.